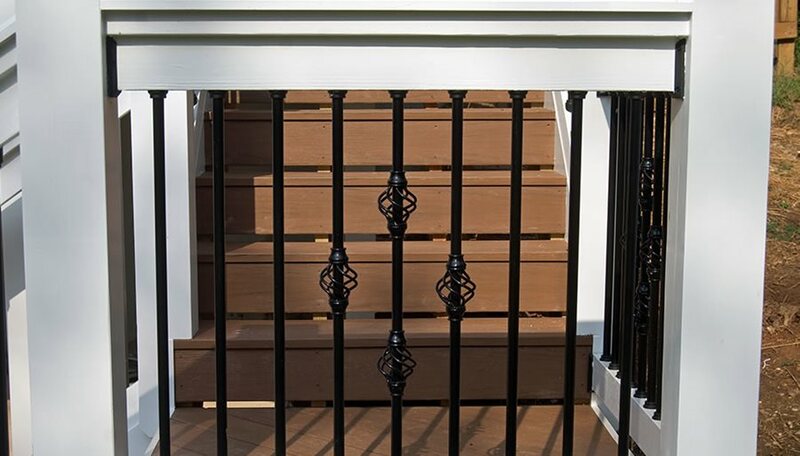 Basket accessories for metal railings can be added to give your railing a custom look. Cable rail has a sleek, contemporary profile. Here, TimberTech’s Evolutions rail uses a cable infill for a modern look. White railing is among the most popular options because it matches the trim on most homes. 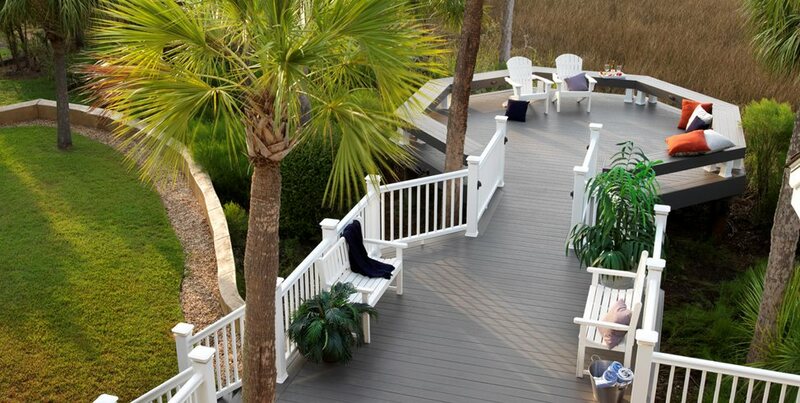 White railing has a classic look for Cape Cod, Colonial, or coastal gardens. 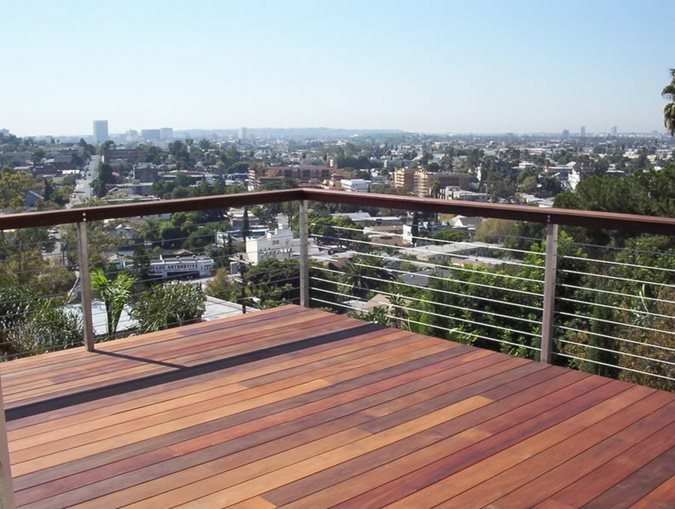 While we think of deck railing as a safety feature, many contractors choose to use railing as an architectural element even on projects where it’s not required. 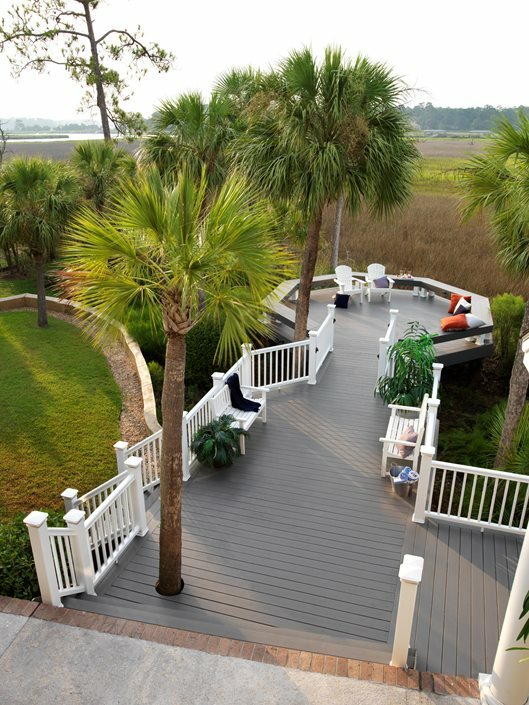 Railing visually finishes the look of the deck, and can add style and panache to your deck design. 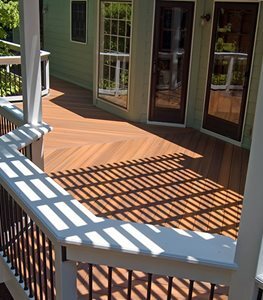 - The posts on your deck railing are usually 4 x 4” or 6 x 6”. 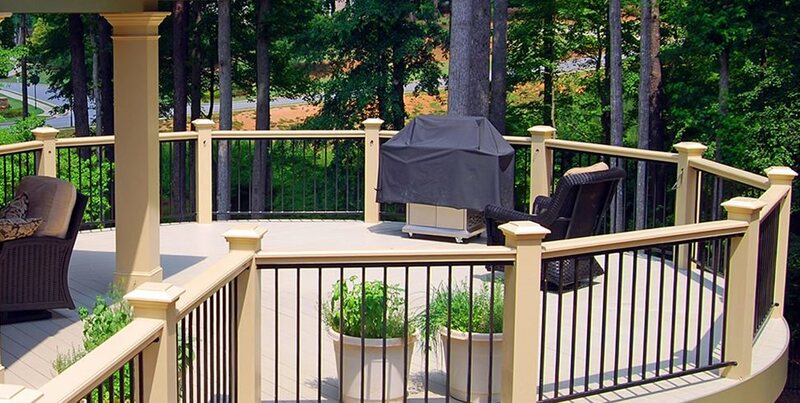 The posts do all of the heavy duty work in keeping your deck railing upright, sturdy and safe. The posts can hold up traditional balusters or spindles, or can provide the framework for a cable rail system or tempered glass panels. - Balusters and spindles are the traditional pickets that run vertically along your railing, and provide protection as well as visually define the space. Newer options such as horizontal metal cables provide the same function, yet have a more contemporary look. 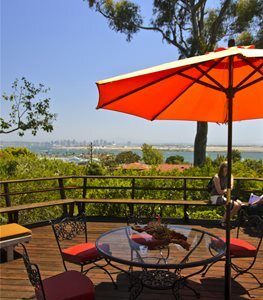 Cable rails have the advantage of not impeding the surrounding view, so even if you are lying in a lounge chair, you can still enjoy the scenery. - Post caps or finials sit on top of your post and add a decorative touch that can coordinate with your architecture or just give the post a finished book. 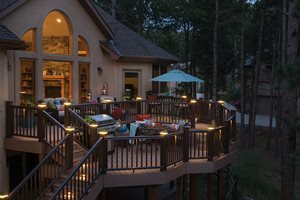 Many brands of composite railing offer posts with lighting included, or you can repeat the finials from elsewhere on the home for a continuous design. Types of RailingThere are many different types of railing and each one has its own set of advantages and architectural styles they go with. 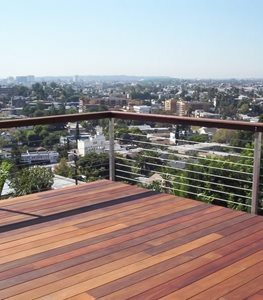 A wooden railing is among the simplest options, and it also gives you a lot of flexibility since your contractor can construct something custom or mix and match premade pieces to get just the right look. 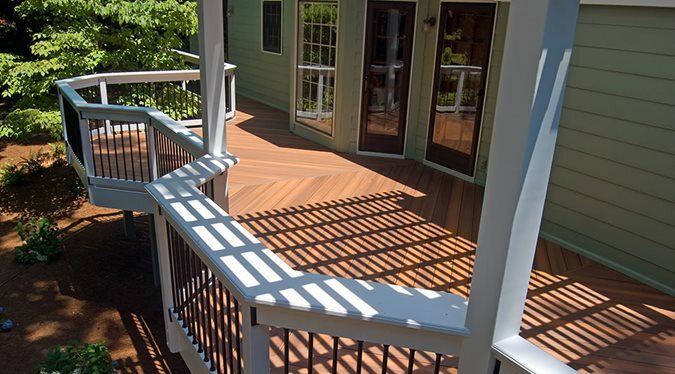 This is the most inexpensive type of railing and goes best with wooden decks. 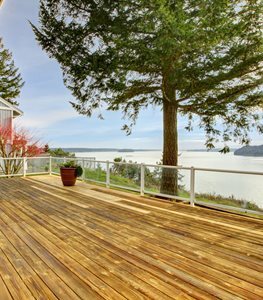 The downside of wood is that it needs regular maintenance such as cleaning, staining, or painting to stay structurally sound and continue looking good. 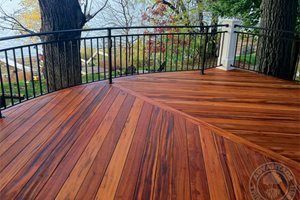 All of the curves and crevices of a railing can make it time-consuming to maintain if it’s made of wood. 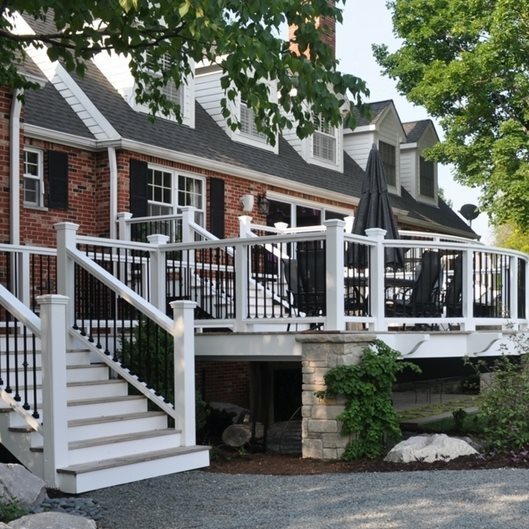 The advantage of capped composite railing is that it looks clean and fresh with very little ongoing maintenance, and it’s in the middle of the pack pricewise, with the materials running $15-$30 per linear foot. 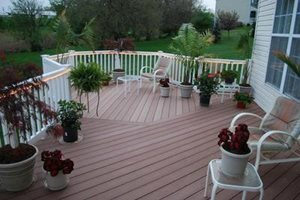 There are number of reputable brands, so you should be able to find a style and color that works with the materials on your deck as well as the style of your home. 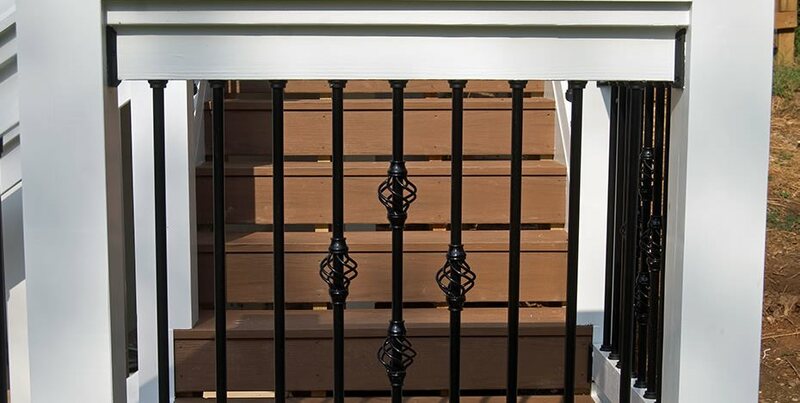 The RadianceRail line from TimberTech is a popular option among contractors because it has hidden fasteners and comes in styles that look good with Colonial, coastal, contemporary and traditional homes. 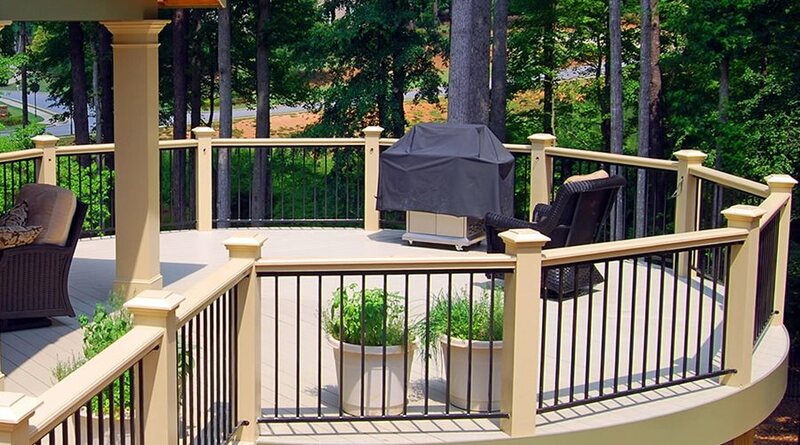 Just like with wood, you can mix and match components to customize the railing to your deck. 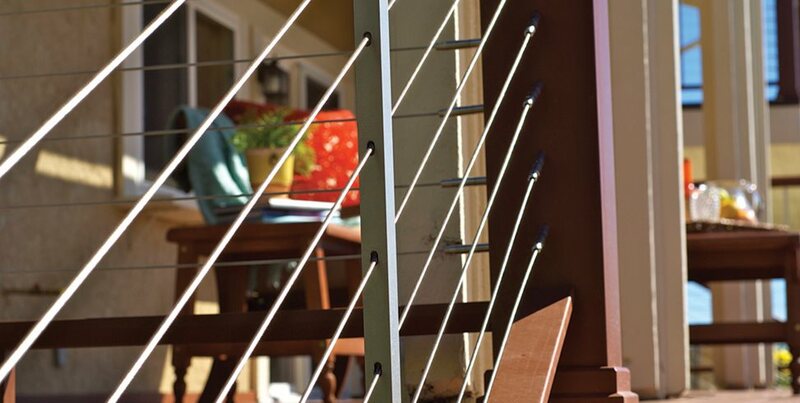 There are many types of metal railing available, but the most common are aluminum, galvanized steel, and iron. 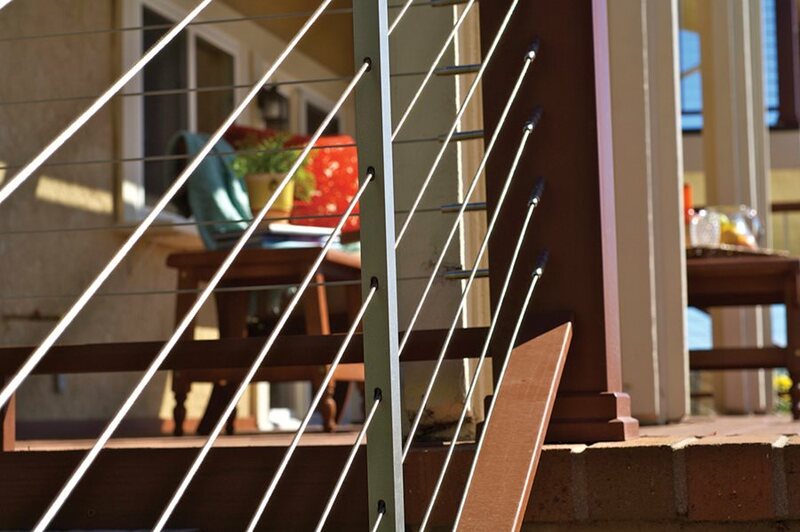 One of the advantages of using metal balusters is that they usually have a slimmer profile than composite or wood, so are less likely to block the view of the landscape beyond. Chuck Edwards of Breckon Land Design Inc. in Garden City, ID points out another advantage: “Balusters, posts and finials can be made custom out of iron.” This lets you match the architecture or create a new design. For pre-made components, Westbury Aluminum and Fortress Iron are two well-regarded brands. Local materials also bring benefits. Not only do they intuitively fit in with the surroundings, but a local variety of stone won't crack or crumble under the heat of the sun. In this landscape, the designed areas reflect the plants and materials found in nature, and feel integrated with the natural setting. 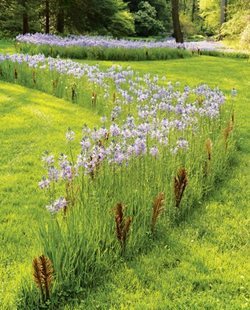 While cable rail is a high-end option, with the materials costing $60 or more per linear foot, homeowners with a view often choose cable rail because it disappears visually into the landscape. 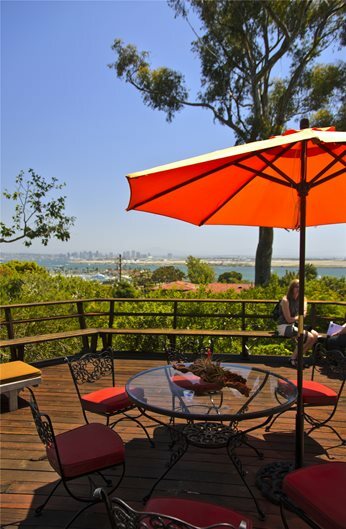 The horizontal cables are attached to wooden or composite posts, and have a sleek, somewhat industrial look which goes beautifully with modern landscapes. Check out Feeney Cable Rail to see what's available. 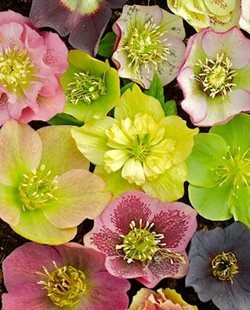 Tempered glass is a great option for landscapes with a lot of wind. If you’d like to stretch out on a lounge chair and enjoy the sunshine without the wind tossing your hair this way and that, tempered glass panels used instead of balusters might be the option for you. 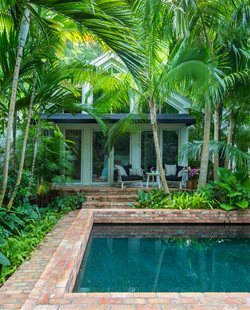 While this is among the pricier materials, it can be worth it for windy or coastal landscapes since it creates a protected outdoor living space without blocking the view. Even if it’s not required, you might choose to install a railing just for the feeling of security. 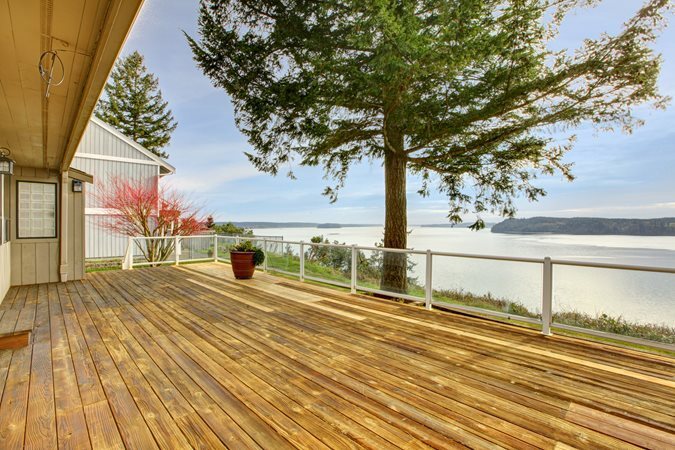 While it’s unlikely that you’d seriously injure yourself by stepping off a deck that’s only 24 inches off the ground, a deck without a railing feels insecure and can be a less inviting place to spend your time. 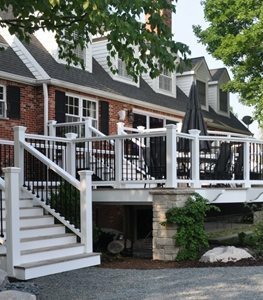 Tying in with the architecture is another reason people choose to install railings. You can match the finials on your railings to those on your house, paint balusters to match your trim, and select railing components which enhance the design of your deck and home. “Many people choose white railings because the trim on their house is white,” says Bobby Parks of Peachtree Decks & Porches in Alpharetta, GA. He recommends using Sherwin-Williams Duration paint on outdoor railings.